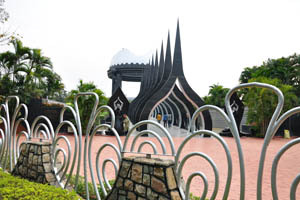 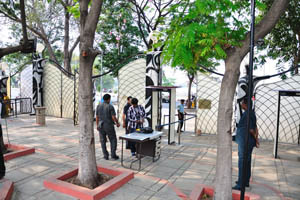 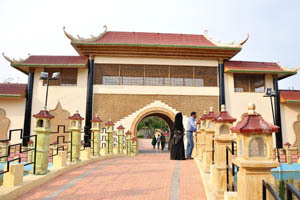 Security check at the entrance. 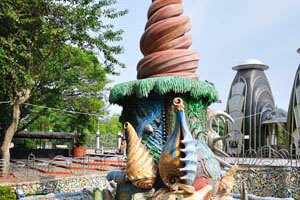 Statue consists from the artificial sinks and crocodiles. 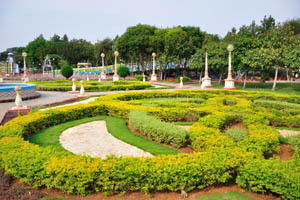 People go out from the garden. 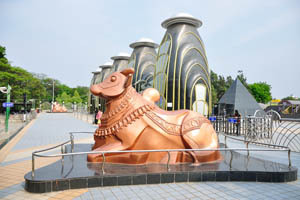 Brown color sculpture of the cow. 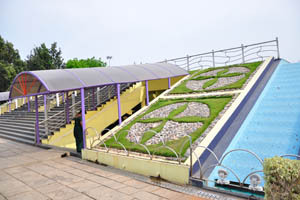 Landscape design over the train station. 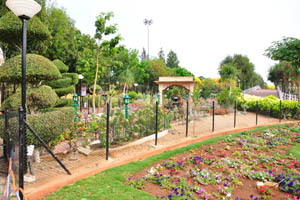 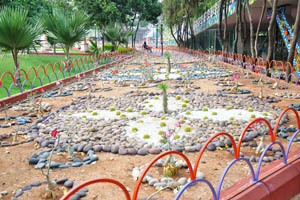 Flower beds with a small fences. 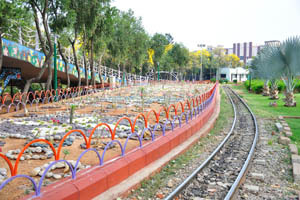 This railroad has only one stop. 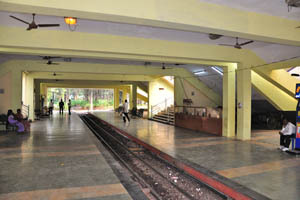 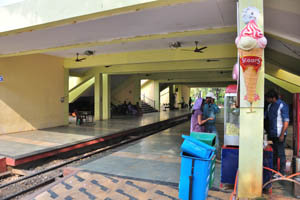 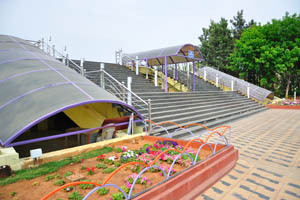 Wide stairway over the railway station. 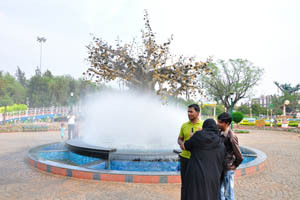 The water fountain is not working yet. 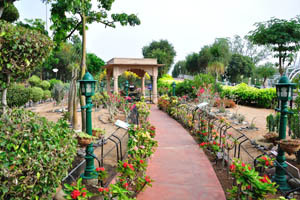 The main alley of the garden. 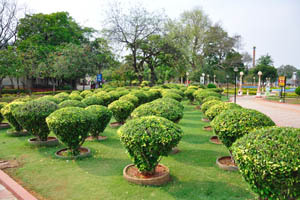 Tiny shrubs as an element of the landscape design. 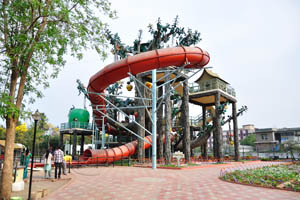 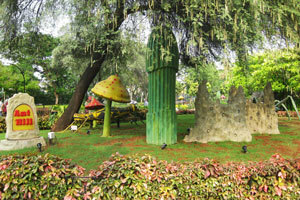 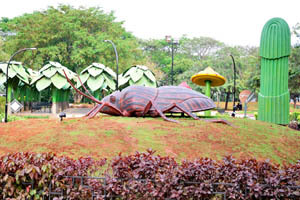 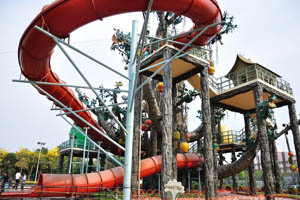 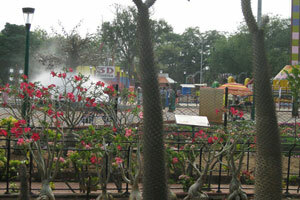 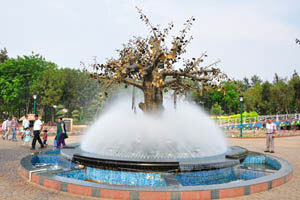 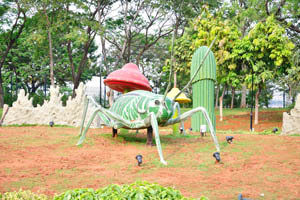 Water ride is decorated with huge fruits. 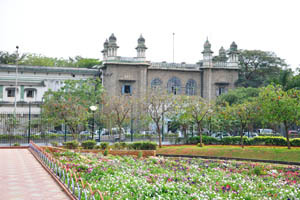 Ancient castle over the road. 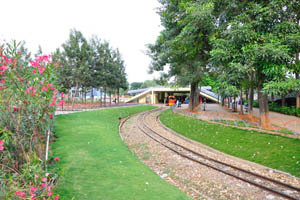 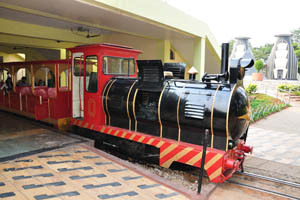 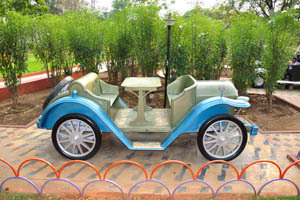 Railway of the toy train. 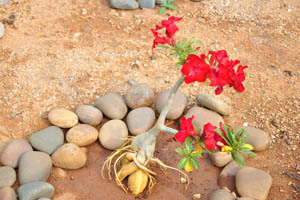 Adenium with a red flowers. 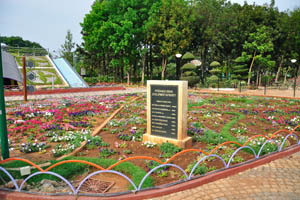 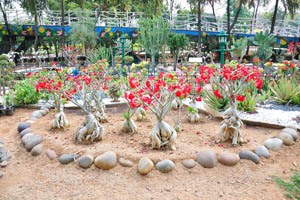 Wide flower bed with the adeniums. 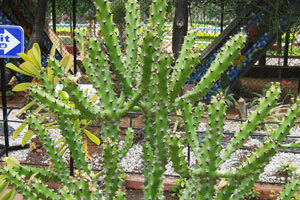 Flower bed with the echinopsis grusonii. 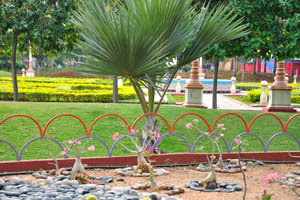 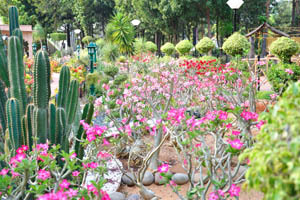 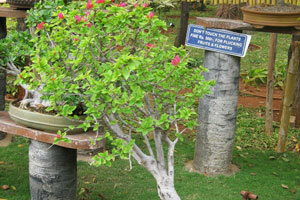 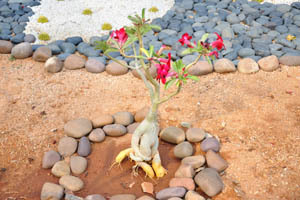 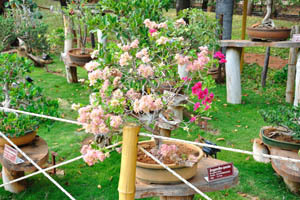 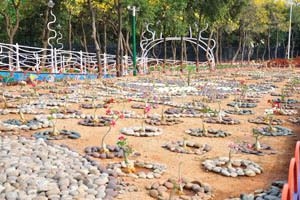 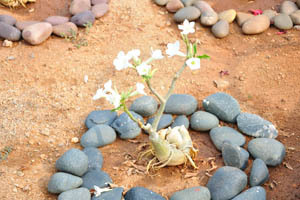 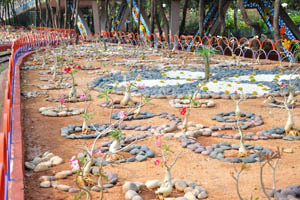 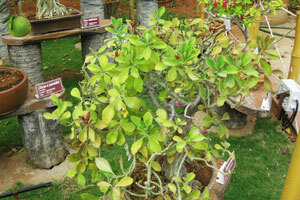 Each adenium is surrounded by the ring of stones. 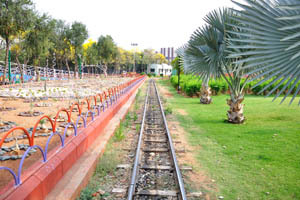 Bismarck palms have been planted along the railway. 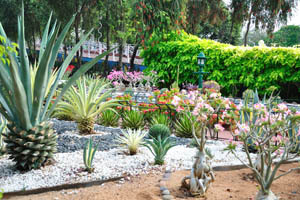 The center of the flowerbed is decorated by pachypodiums. 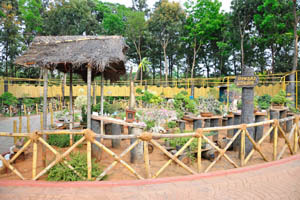 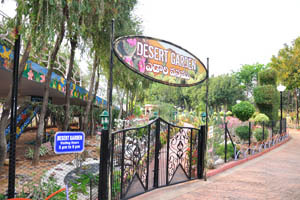 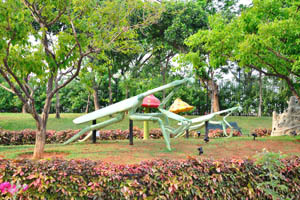 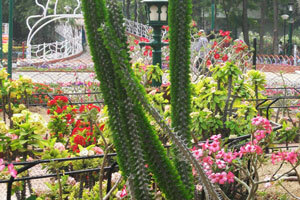 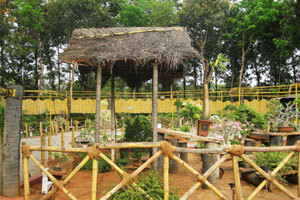 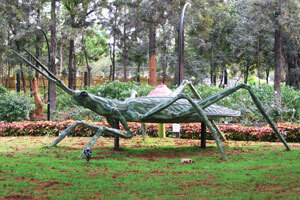 Desert Garden: visiting hours 5pm to 9pm. 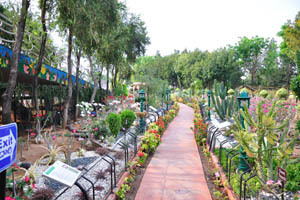 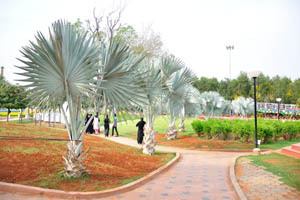 The pathway inside the Desert Garden. 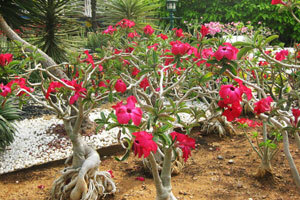 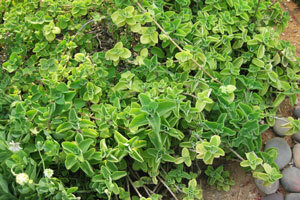 The great quantity of adeniums grow here. 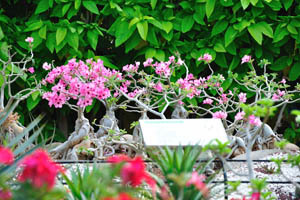 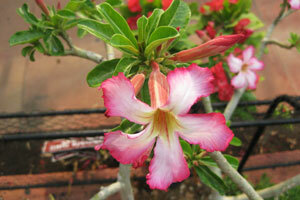 Adenium flowers with wide pink edge. 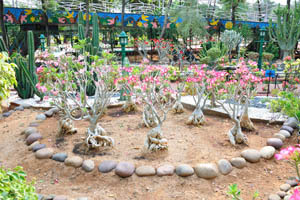 Huge adeniums with white flowers with pink edge. 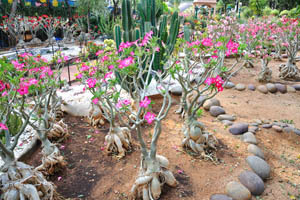 Huge adeniums with magenta flowers. 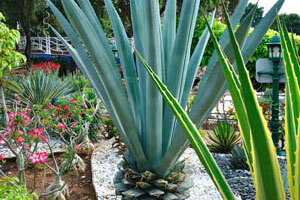 Agaves of different sizes and types. 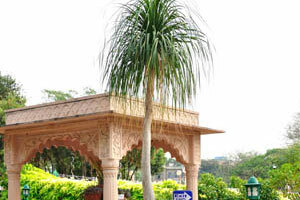 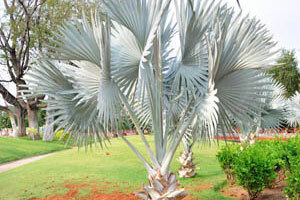 Beaucarnea recurvata (elephant's foot, ponytail palm). 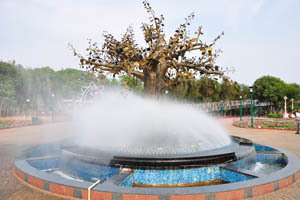 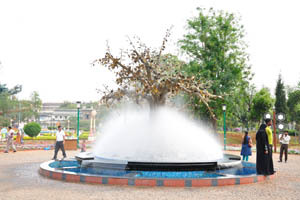 The tree with golden leaves inside the water fog fountain. 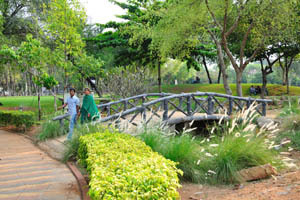 Landscape shrubs and garden bridge. 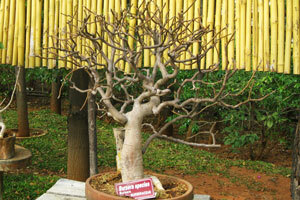 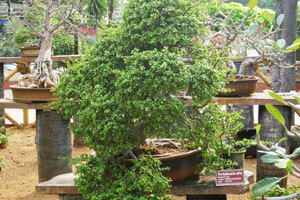 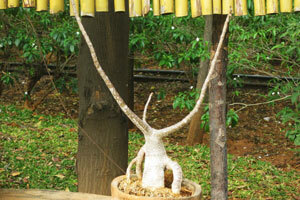 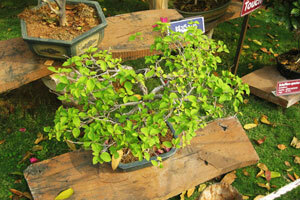 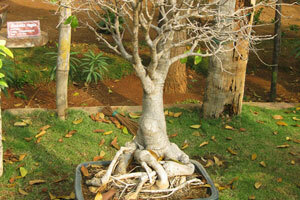 Bonsai Wonder: the bonsai collection. 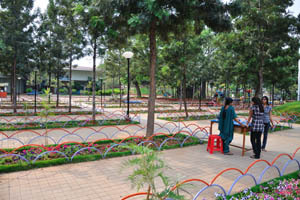 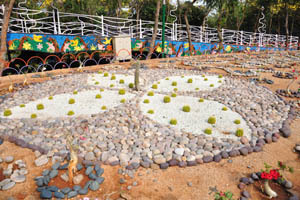 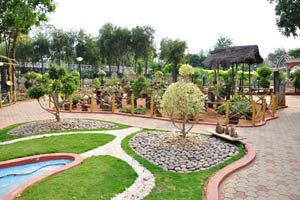 Landscape design with the use of the small round stones. 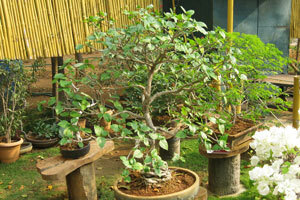 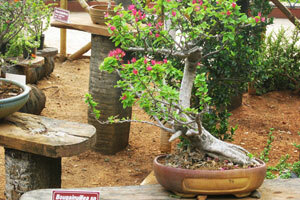 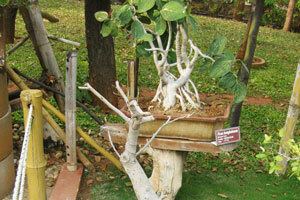 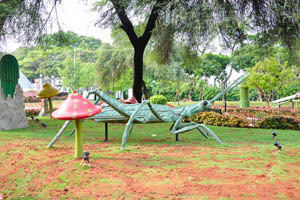 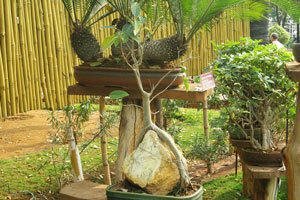 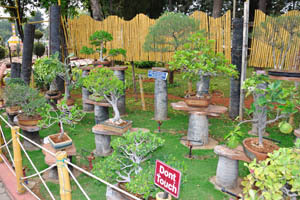 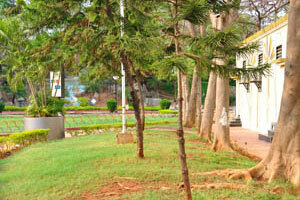 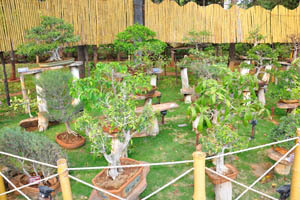 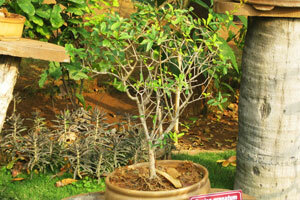 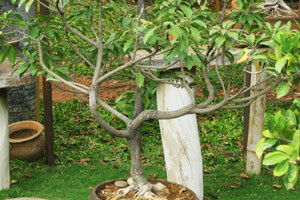 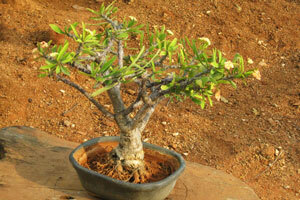 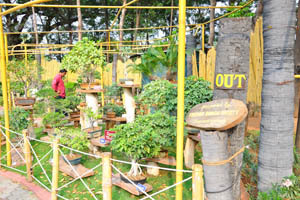 Supported by Friends Bonsai Society, Secunderabad. 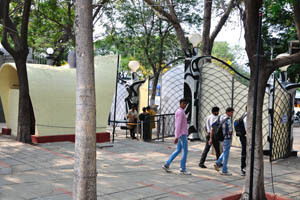 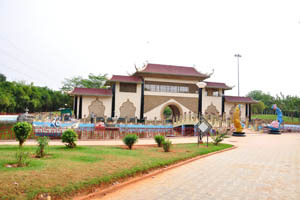 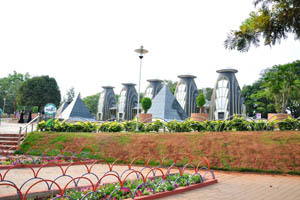 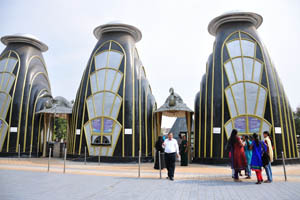 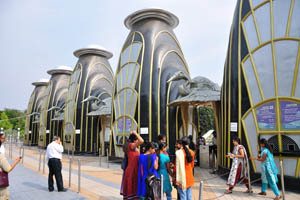 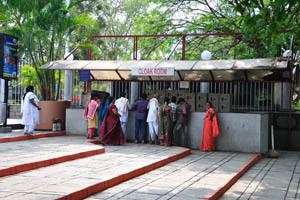 This five tall and unique buildings function as a ticket counters. 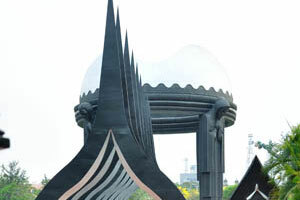 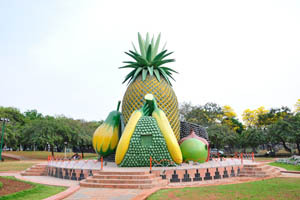 Building with the shape of pineapple and other fruits. 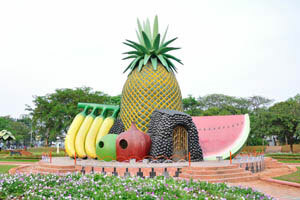 Building with the shape of banana and watermelon. 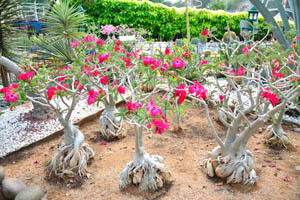 Trees with roots on the surface. 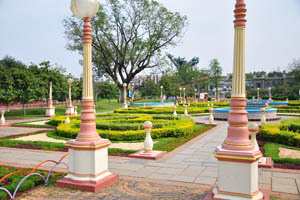 The building in the middle of the lake. 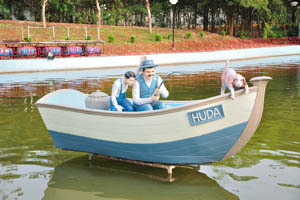 The sculpture of two fishermen and their dog. 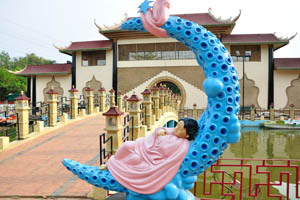 The sculpture of the moon and the child. 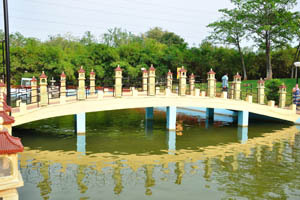 This pathway lays over the lake. 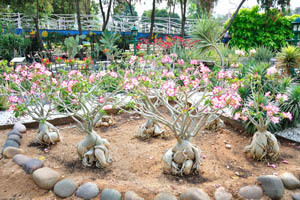 Euphorbia with the thick stems in blossom. 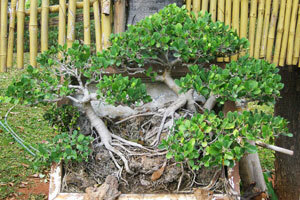 The bamboo fence of the Bonsai Wonder. 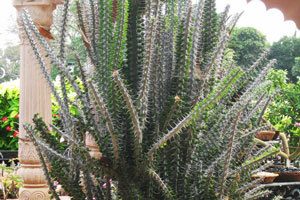 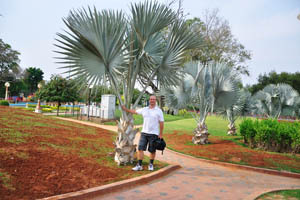 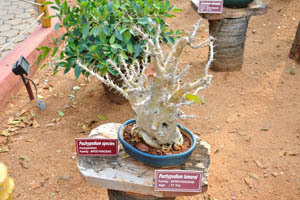 Euphorbia with the long stems. 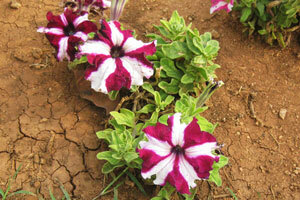 Red flowers with wide white stripes. 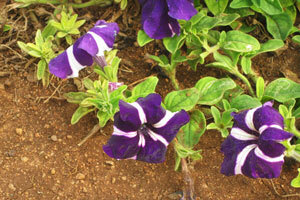 Dark blue flowers with wide white stripes. 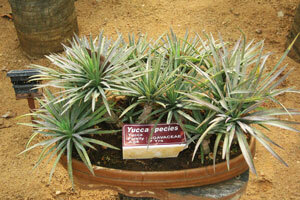 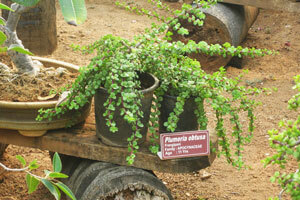 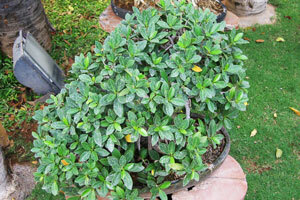 Small succulent shrub in the pot. 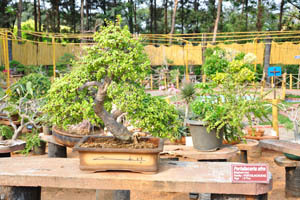 Bonsai tree is without the label tag. 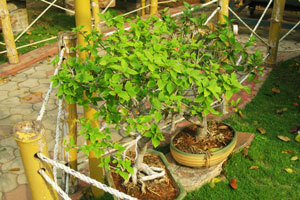 Hibiscus rosa-sinensis (China rose), 15 years. 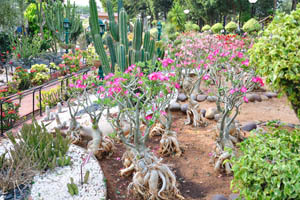 Adansonia digitata (Baobab tree), 17 years. 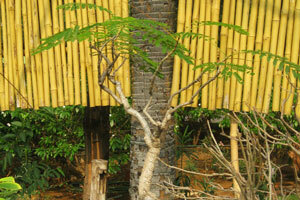 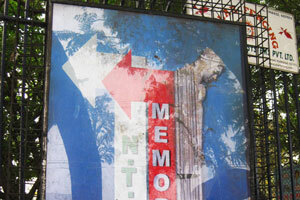 Delonix regia (Gulmohar), 11 years. 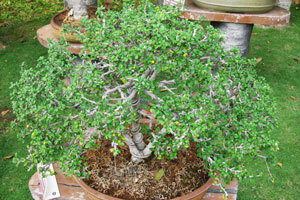 Punica granatum (Pomegranate), 13 years. 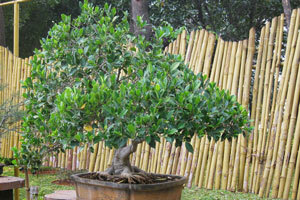 Ficus benjamina nuda, 11 years. 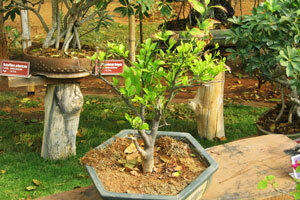 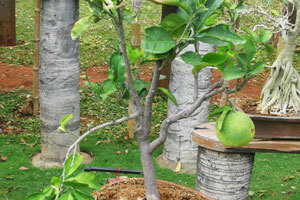 Citrus reticulata (Mandarin orange), 9 years. 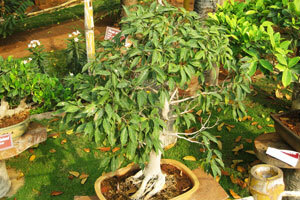 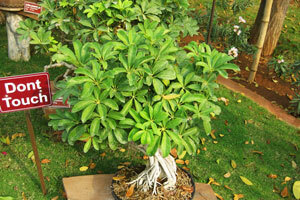 Schefflera arboricola, family Araliaceae, 14 years. 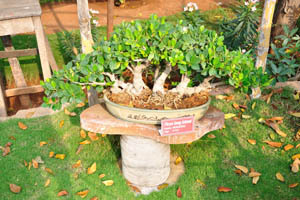 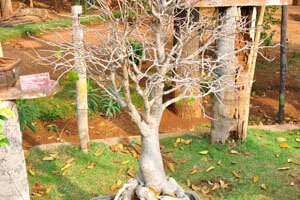 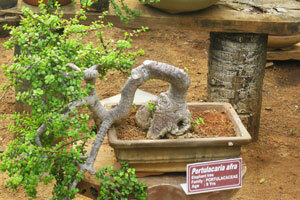 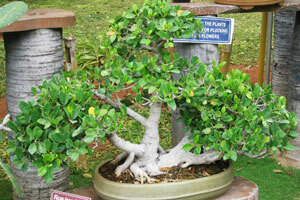 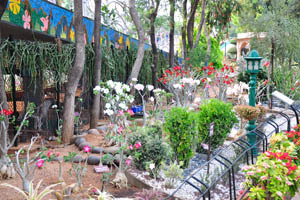 Portulacaria afra (Elephant tree), age - 9 years. 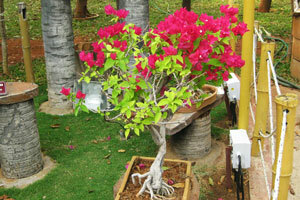 Bougainvillea sp, family Nyctaginaceae, 9 years. 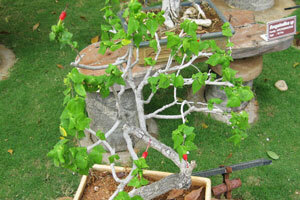 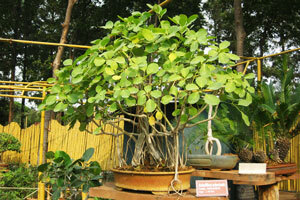 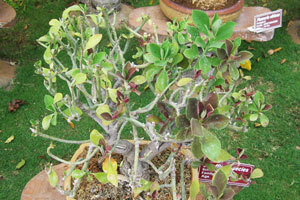 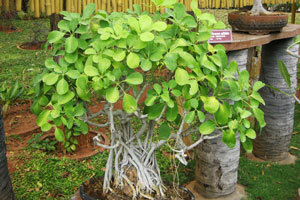 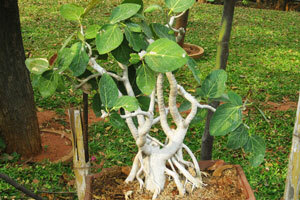 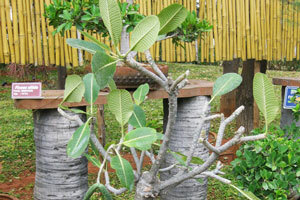 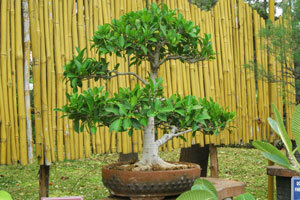 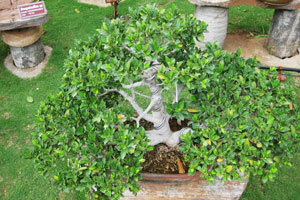 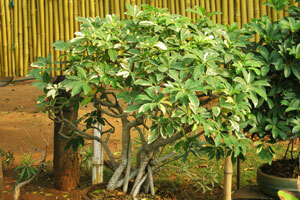 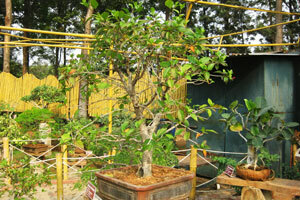 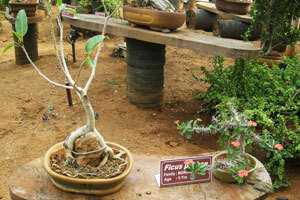 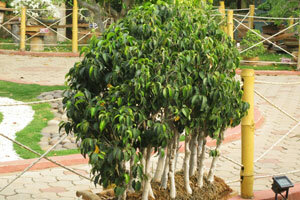 Ficus pickhan, family Moraceae, 5 years. 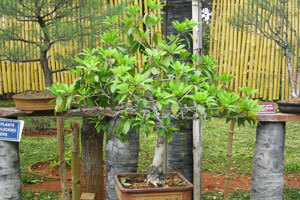 Manilkara zapota (Sapodilla), 14 years. 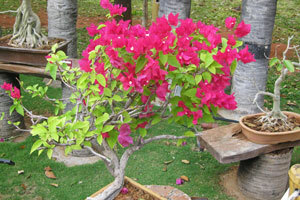 Blooming bougainvillea, age - 7 years. 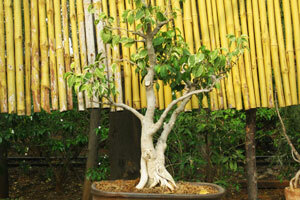 Ficus benjamina 'variegata', 21 years. 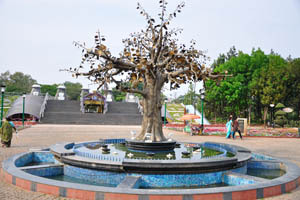 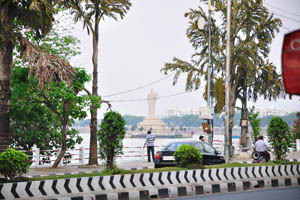 Buddha statue view from the NTR Memorial.